September 2012 will always be have a special place in my heart. That is when I fulfilled a fifteen year dream to spend a month in France. My friend and I spent one week in Connelles, Normandy area and three weeks in Paris. Museums filled our mornings, cafes or parks our afternoons, and strolls along the bridges and boulevards filled our evenings. With so much to see, feel, and enjoy not much time was left for reading other than perusing the street map for the next day’s adventures. Months later I have finished reading the three books I picked up in Paris. 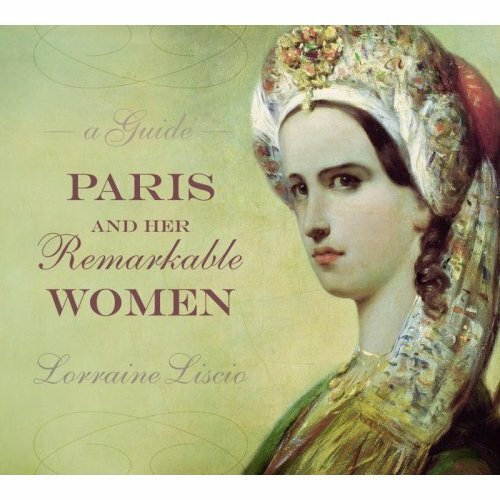 A wonderful book I found at the Musee de la Vie Romantique’s ( Museum of the Romantics) tiny gift store was “Paris and Her Remarkable Women” by Lorraine Liscio. The Romantique is one of three literary museums. Located in the ninth arrondissement it is free to enter, has a lovely garden cafe, and small enough to go through in an hour, or two. It is dedicated to French novelist and playwright George Sand, who was actually Amantine Lucile Aurore Dupin. The second reason I was drawn to the book was that all of the subjects in Liscio’s book are strong women. They are amazing French chingonas of the arts and sciences. The author of “Paris and Her Remarkable Women,” is Lorraine Liscio, who holds an MA in French and a PhD in English. She also served as Director of Women’s Studies at Boston College where she taught literature. Her resume sounds so “academic” but her writing style is very engaging, filled with the sights and sounds of the different eras in Paris. She includes the residences, museums and other Paris sites where the works of these women are held for posterity. The book makes a wonderful travel guide about the accomplished women in the history of Paris. The lives of a saint (Genevieve, Patron Saint of Paris) to scientists (Madame du Chatelet, Marie Curie); writers (Heloise, Sand, Collete) to feminists (Marie Jean Roland, Christine de Pisan, Simone de Beauvoir); and actors (Eliza Felix, Sarah Bernhardt) to artists (Elisabeth Le Brun, Camille Claudel) are found in this hardcover 126 page book of tantalizing stories. The illustrations and photos in the book give us further insight into the history of Paris. The majority of these learned women weren’t “allowed” to attend the schools their male counterparts could attend, but they nevertheless enhanced social and political awareness in a variety of areas. We find that some women who were referred to in history as courtesans, mistresses, or lovers of famous men were actually so much more. They were exceptional women who managed to steer their way through time periods which were oppressive to women. This is a “keeper” book, one which I will place in my bookcase, lend only to select friends and a book that will take me back to Paris whenever I need to get a taste of the City of Light once again. Are there any books you’ve collected that take you back to a vacation spot? Every Tuesday, over on Thoughtful, there are book reviews. For reviews on a variety of books click on over to: From The Bookshelf . Sounds like a very interesting book. Some of the best books are written about real people! I'm looking forward to more Tuesday book reviews. How inspiring to pick up a book about historically significant women in Paris! In Madrid, I got a tome on the life of Lope de Vega. I'll have to fit it into my reading list and reminisce about Spain. From now on I'm going to seek these types of books out on my travels. I have yet to visit Spain or Portugal, but I'll keep your recommendation on de Vega handy.